Applying real-time, cost-effective Complex Event processing (CEP) in the cloud has been an important goal in recent years. Distributed Stream Processing Systems (DSPS) have been widely adopted by major computing companies such as Facebook and Twitter for performing scalable event processing in streaming data. However, dynamically balancing the load of the DSPS’ components can be particularly challenging due to the high volume of data, the components’ state management needs, and the low latency processing requirements. Systems should be able to cope with these challenges and adapt to dynamic and unpredictable load changes in real-time. 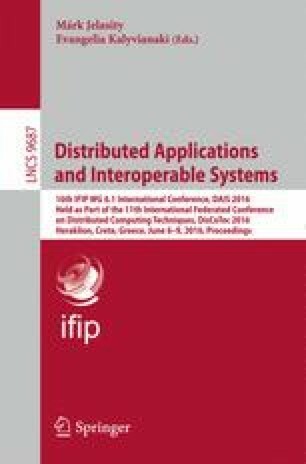 Our approach makes the following contributions: (i) we formulate the load balancing problem in distributed CEP systems as an instance of the job-shop scheduling problem, and (ii) we present a novel framework that dynamically balances the load of CEP engines in real-time and adapts to sudden changes in the volume of streaming data by exploiting two balancing policies. Our detailed experimental evaluation using data from the Twitter social network indicates the benefits of our approach in the system’s throughput. This research has been financed by the European Union through the FP7 ERC IDEAS 308019 NGHCS project and the Horizon2020 688380 VaVeL project.